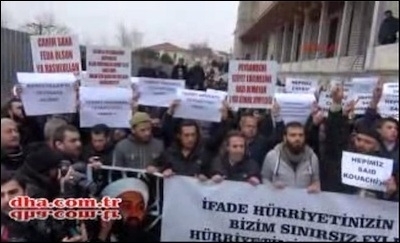 Protesters in front of an Istanbul mosque hold signs honoring the terrorists who perpetrated the January 2015 Paris terror attacks. Alain Juppé, former French prime minister (1995-97), once said: "I would like to stress this point without reservation: France sees the Arab Spring as auspicious. The Arab Spring holds out tremendous hope -- hope for democracy and the rule of law, hope for peace and stability, hope for better future in which every person can pursue goals commensurate with his or her needs, talents and ambitions." Ten years ago, in October and November 2005, a series of riots took place in the suburbs of Paris and other French cities. Rioters burned cars and public buildings at night. The rioters were mostly young immigrants from North Africa and sub-Saharan Africa who declared Islam as an inseparable part of their identity. The French government declared a state of emergency, but the riots resulted in three deaths (of non-rioters), many police injuries and nearly 3,000 arrests. Turkey's President Recep Tayyip Erdogan (then prime minister) easily diagnosed the reason for the riots -- in his usual Islamist way: "I told [the French] before," he said. "The [Islamic] headscarf ban has triggered these riots." Nothing could convince Erdogan that bad men might be doing bad things in the same of Islam. 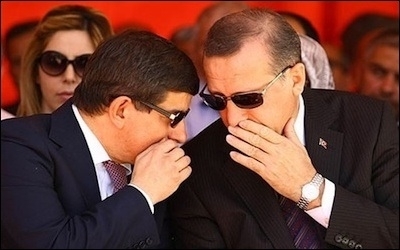 President Recep Tayyip Erdogan (right) and Prime Minister Ahmet Davutoglu (left) habitually refuse to acknowledge Islamist violence as such. Nine years after those French riots, a big group of bearded fellows started to behead "infidels" and release their videos, invade and plunder large swaths of land in Syria and Iraq, where they declared "sharia rule," and then "an Islamic caliphate." Around the same time, when the death toll in Syria and Iraq at the hands of the Islamic State (IS) was at several thousand, Erdogan, ironically in Paris, and after a meeting with French President François Hollande, accused "those who try to portray [IS] as an Islamic organization...."
He then lectured his Paris audience: "Mind you, I am deliberately avoiding the use of the acronym ISIS [because it contains the word 'Islamic']. I use the name 'Deash' [sic] because these are terrorists." Funny, there was no such word or acronym as "Deash." There is, though, "Daesh" ("ad-dawlah al-Islamiyah fil- Iraq wa ash-Sham"). It was a nice try by Erdogan, but not quite smart enough. The Arabic acronym "Daesh" also contains the word Islamic ("al-Islamiyah"). Erdogan preferred not to get the Islamic message as, Daniel Pipes, president of the Middle East Forum, forcefully reminded everyone after the Paris attacks "as though name-calling addresses these real issues..."
Back in January, Muslim crowds appeared before prayer time in front of a mosque in Istanbul's super-devout Fatih district. They were there to hold funeral services (in absentia) for the Kouachi brothers, the terrorists who had killed 17 in an attack on the Charlie Hebdo magazine in Paris. The worshippers at the mosque then held a demonstration with a banner and placards: "If freedom of expression has no limits, be prepared for our freedom to commit actions with no limits," "We are threatening (you)! Do you dare?" and "We are all Kouachi" (in what appears like the Turkish response to the Charlie Hebdo slogan "Je suis Charlie"). In Erdogan's Turkey, "protestors" could hold signs honoring the terrorists who perpetrated the Paris attacks, as well as Osama bin Laden. No one was prosecuted under the articles of the Turkish Penal Code that regulate "praising crime and criminals." Turkey's leaders don't hide their desire to see a "mildly Islamist" Sunni regime rule Syria. Your columnist wrote at that time: "Ironically, Turkey's systematic euphemizing of Islamist terrorism comes at a time when the country itself is exposed to the risk of being a target of the kind of men Turks praise as martyrs ... [Turkish Prime Minister Ahmet] Davutoglu should be able to understand that if a terrorist decided to strike Turkey in the name of jihad, his name will not be Benjamin Netanyahu." Nine months later, the Islamic State came to Ankara. On October 10, 2015, two IS suicide bombers killed over 100 people in the heart of the Turkish capital. Despite evidence, Erdogan and Davutoglu tried to portray the attack as "cocktail terror" involving not just "Daesh" but also Kurdish and leftist groups. It was self-deception at its best: Muslims do not resort to terror and violence. Any Western support for what Erdogan and Davutoglu wickedly call "mild Islamist groups" in Syria will only further expose the free world to the risk of jihadist attacks. The two Turkish leaders do not hide their ambitions of building a "mildly Islamist" Sunni regime in Syria. Hoping that "mild Islamists" may one day morph into secular, pro-democracy crowds is an extremely dangerous deception designed to advance Islamism. Anyone can morph into a different ideology. But "mild Islamists" often morph into jihadists. Erdogan's Turkey will never change for the better. Sadly, it is the same Turkey that President Barack Obama said at the G-20 meeting was "a strong partner" in fighting IS. Have a nice sleep, Mr. President!